Bio4Pack achieves a world first with its sustainable packaging solution for fresh meat. Full colour printed compostable packaging now available starting at only 1 copy! At Bio4Pack we are fully aware that companies would like to switch to compostable and sustainable packaging. We are also aware that companies hesitate to make the switch due to lack of familiarity with the materials used. In order to make it easy to gain experience with Bio4Pack packaging, we now offer the possibility of ordering compostable packaging in small quantities, printed in full colour. Starting at only 1 copy! 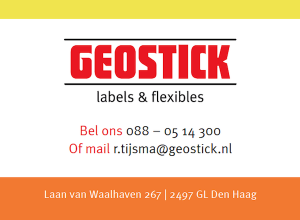 For this purpose we have entered into a collaboration with The Hague-based company Geostick. This company is co-licensed with Bio4Pack to offer digitally printed compostable film which fulfils the strict EN13432 compostability standard. The packaging may then carry the well-known seedling logo (7P0466). Geostick stocks the 5 most popular types of laminates and can deliver quickly and at competitive prices (we certainly do not need any clichés). You can place your order directly with Geostick so that you will receive your packaging as quickly as possible. Bio4Pack’s development gives everyone the opportunity to experience for themselves that compostable packaging is the solution for a circular economy.